I have been lucky enough to visit South Africa’s winelands several times in the past ten years or so, to enjoy not just some of the wine world’s most ravishingly beautiful vineyard scenery, but to get to know the wines pretty well through extensive tasting and visits to wineries as they have operated in a decade of relentless change and improvement. Looking around the timeless, settled vineyards or strolling through the historic Cape Dutch farm buildings, it’s easy to forget that in very real ways, the South African wine industry is a young one. It was only with the collapse of the apartheid system that the Cape’s winemakers once more fully joined the international wine scene, and a world of both challenges and opportunities opened up. After three decades of the new wine era, the task of modernising wines, refining styles, exploring new regions and improving quality has made tremendous progress. 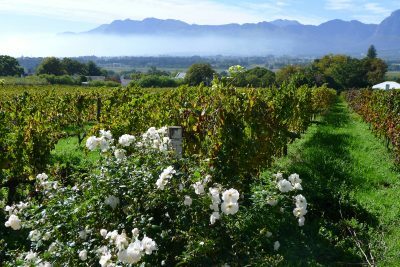 The photo shows the vineyard at Grande Roche in Paarl, looking to the Drakenstein mountains. 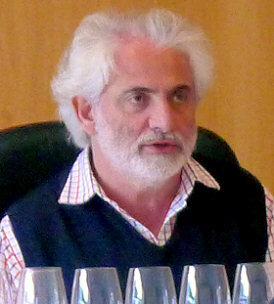 I was delighted when Michael Fridjhon, one of the Cape’s most experienced wine writers and judges, invited me to be one of three international judges for the 2012 Old Mutual Trophy Wine Show, along with Anthony Rose of the Independent (and of course my buddy in www.thewinegang.com) and winemaker Brian Croser of Tapanappa in the Barossa Valley. We would join six local judges – wine industry professionals – to spend five days scrutinising 1,025 South African wines. Michael (left) and the Trophy Wine Show are respected throughout the Cape wine industry, Michael for his searching palate, encyclopaedic knowledge and incisive mind and the show for the rigour with which its nine judges undertake their task: the average number of gold medals awarded is a miserly 2% of the entries, and wines have to be extremely good to approach bronze medal level, let alone silver or gold. My week spent judging was absolutely fascinating. Not only did it provide an opportunity for the serious, unhurried study of today’s South African wines in great depth, but the lunches and dinners spent discussing South Africa’s wine industry with local professionals were full of interest. My conclusions by the end of my week? The infamous ‘burnt rubber’ note that many people have found off-putting in South African reds was barely in evidence, suggesting that leaf-roll virus and perhaps other viticultural and winemaking causes are being addressed. The Pinotages on show – and I judged over 40 of them – surprised with the generally very high quality given the grape’s less than stellar reputation. Sauvignon Blanc was good, though possibly some producers are pulling back from the pungently herbaceous style a little too far. The small category of sweet and fortified wines that I tasted was terrific, including the show-stopping 1929 ‘Port’ from KWV. In all there was plenty of evidence here that the country’s more conscientious winemakers continue to refine both their wine making and their vision for what each variety is capable of, and what each terroir has the potential to say about South African wine. The culmination of the week of judging is the trophy tasting. The gold medal winners in each class are gathered and retasted by all judges to find the outright best in class. Below are my brief notes on all of the gold medal wines that made it to this stage, as written during the trophy tasting. The trophy winners are listed first, and the tasting was, of course, blind. Lovely sense of freshness here, of graphite finesse. Does the palate lack a touch of fruit? Classic, structured stuff. Panel average score: 95.7/100. Big, sweet-fruited, creamy nose. Loads of flavour and concentrated into a long, long juicy and clear finish. Panel average score: 95.7/100. Lovely stuff, so elegantly floral with its violet perfume. So pure on the palate, a touch of bloodiness and terrific fruit. Panel average score: 94.8/100. Developed, rich, boldly fruity nose. Lovely palate richness and balance with racy, precise acidity. Panel average score: 94.4/100. Beautiful apricot and barley sugar nose and lovely Botrytis. Tangy fruit with lots of orange zest zing and clarity. Panel average score: 95.8/100. Slightly neutral. Pretty, balanced and quite fine. Panel average score: 93.7/100. Touch of bloody, gamy character to the fruit. Developed, but ripe and minty. Big and dry on the palate but beautifully balanced. Panel average score: 93.8/100. More earthy, plummy and ripe. More bloody character here, ripe and sweet on the palate. Panel average score: 95.3/100. High quality French oak smokiness and finesse. Serious palate but so delicate, refined. Panel average score: 94.2/100. Fine, classic wet wool nuances to lime and lemon. Hint of sweetness persists on the palate. Is it a touch dilute? Panel average score: 95.6/100. Very Port-like, nice dried fruit character, not as sweet but more complex and layered. Panel average score: 94.4/100. A touch of toffee and nougat here is lovely. Very precise and fresh on the palate, very long and clean finish. Panel average score: 95.5/100. Quite subtle, refined, graphitey stuff. Serious if a touch too dry on the palate. Panel average score: 93.0/100. Slightly more lifted style here, creamy, gamy, perfumed. Big and dry, terrific tangy fruit and balance. Panel average score: 94.8/100. Dark. Plenty of spice and charry oak. Lovely floral nuances emerge, but perhaps lacks a touch of flesh. Panel average score: 94.3/100. Is this just a touch dilute beneath a big, smoky, green bean character? Fine effort at the style. Panel average score: 94.5/100. The green streak here is arguably slightly raw, but so clean and punchy on the palate. Panel average score: 94.3/100. Lovely balance. Creamy, but the oak is so nicely judged and this has massive freshness. Classy. Panel average score: 95.5/100. Creamy, custardy character but full of flavour. Well balanced, fresh. Panel average score: 94.7/100. Big thiol nose is all grassiness and pungency, but the palate has lovely zest and precision. Panel average score: 94.4/100. Nicely developed toast here, very classical. Juicy lemon freshness and vitality on the palate. terrific. Panel average score: 95.2/100. Restrained oak, creaminess over tropical fruit but so delicate and refined. Long. Panel average score: 95.8/100. Stunning stuff, layered with walnut and Seville orange. Fresh palate with mellow, sweet flavours balanced by precise acid structure. Panel average score: 96.8/100. These are the show’s other gold medal-winning wines that were tasted, in their classes, alongside the trophy-winning wines above. Lovely freshness and finesse. A pretty wine but lacks some concentration. Panel average score: 93.3/100. Gentle elderflower pungency. Very precise, pithy palate. Panel average score: 94.0/100. Big, striking green aromatics, a hint of honeyed richness. Panel average score: 94.7/100. Not as fresh on the nose as some here. Lacks a little clarity for me. Panel average score: 93.7/100. Young and rather pear-droppy nose. Lovely dry apple fruit on the palate. Panel average score: 92.7/100. Very refined French oak. Juicy lime and lemon style, long and precise. Panel average score: 95.4/100. Subtle, really refined aromatics. Nice oak quality, lots of freshness and ripe fruit. Zesty finish. Panel average score: 95.4/100. A bit of floral and apricot lift here. Honeyed richness, delicious balance and really tangy finish. Panel average score: 94.0/100. Moderate style, nice use of oak here, if a bit less powerful, less concentrated. Panel average score: 94.2/100. Lots of lanolin quality here, the palate very bright and fresh, for me a touch harsh. Panel average score: 95.6/100. A touch sweaty – too much for me. Better on the palate, very nicely pithy and dry. Panel average score: 94.2/100. Classic, very dry, arguably just too austere. Panel average score: 93.2/100. Not so svelte or refined. Lovely density of fruit and really supple tannins. Panel average score: 94.6/100. Big animal nose, for me verging into Bretty territory. Sweet, bloody palate – very Bordeaux-like. Panel average score: 94.5/100. Delicious sweet richness, perhaps just verging on raisiny. Deep chocolate and plum palate edged with bloodiness. Delicious. Panel average score: 95.0/100. Quite a coffee-ish, big mulberry nose. Beautiful fruit: sweet, plush and elegant. More commercial style. Panel average score: 93.4/100. Lots of toast and vanilla here, very alluring. Lime-like, Riesling character. Great clarity despite massive sweetness. Panel average score: 95.3/100. Brown sugar, tawny richness. Strong, powerful, lovely power and balance if a touch simple perhaps. Panel average score: 94.6/100. A touch varnishy to me, nice and leafy lift and floral, but a little simple. Panel average score: 93.5/100. For more information see trophywineshow.co.za.